Puerto Maldonado sits at the confluence of the Tambopata and Madre de Dios Rivers in the Amazon rainforest. The busy beeping and tooting in the city center soundtracks the lives of the nearly 75,000 inhabitants, yet once off the streets, the atmosphere in Puerto Maldonado is relaxed, with the hot and humid temperatures encouraging calm and restfulness. In a city surrounded by reserves and national parks, Puerto Maldonado holidays allow visitors to access some of the best areas of primary rainforest in the world. Puerto Maldonado is in Madre de Dios Region. Plan the details of your Puerto Maldonado holiday and any onward adventuring with our easy-to-use Peru vacation app . Puerto Maldonado offers an ever-growing number of options for active jungle explorers and those with a hankering for something a little more exclusive. Budget-conscious adventurers can find a suitable place to rest at one of the simpler hotels or hostels in the downtown area. 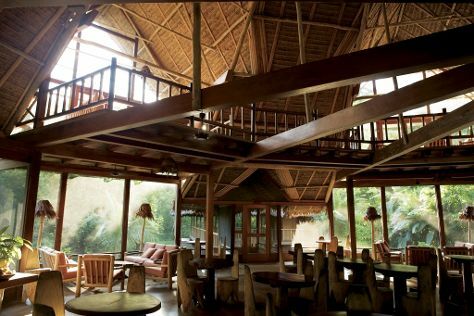 Eco-lodges represent perhaps the trendiest choice in the jungle--these are designed to bring the wilderness indoors, and make as small a mark on the landscape as possible. Resort-style hotels, with loads of facilities and services, generally remains clustered close to the rivers.